Artists and appreciators have a variety of materials and colors to choose from when it comes to framing and matting a piece of artwork. There are all kinds of different options to choose for your frame, which can make it difficult to determine the right one for you. The options are nearly endless, and if you’re not familiar with how framing works, I suggest stopping by your local Jerry’s Artarama framing department and talking to a custom framer. They can explain the many factors of framing from the types of matting and the different styles of hanging to the profound effects of negative space and color choices. Most works of art that live on paper are perfect candidates for being framed with mat board. The matting impacts the overall look of the piece and can draw out specific shapes or colors in the artwork. This helps it to stand out in a way it couldn’t outside of the frame. If you’re looking to frame large photography pieces, you might not need to add matting as the photograph itself often demands the full attention of the viewer. If there is already plenty of white space in your artwork, you should consider thinner matting in a light grey or black. These colors can add contrast and dramatically enhance the centerpiece of work. Certain techniques like floating or double matting, where two colors of mat board are layered on each other for added dimension and style, impact your artwork and create stunning, professional-looking pieces that look great on almost any wall. Aside from the mat board, it’s also important to pick a frame that also complements your work, rather than detracts from it. The idea is to let the artwork dictate which custom options are best to create a positive impact on your work. White and black frames are generally the go-to for many artists but don’t be afraid to look at bold colors, like gold or red, if they work with your piece. Frames can frequently be found in two materials, wood and metal. The most common framing material of the two is wood. This is because it offers sturdier protection and can be sealed tightly at the back of the frame. Metal frames are sleek and simple, giving your artwork a modern, minimal feel. The type of material you chose should be dictated by the artwork and the look you’re trying to achieve. 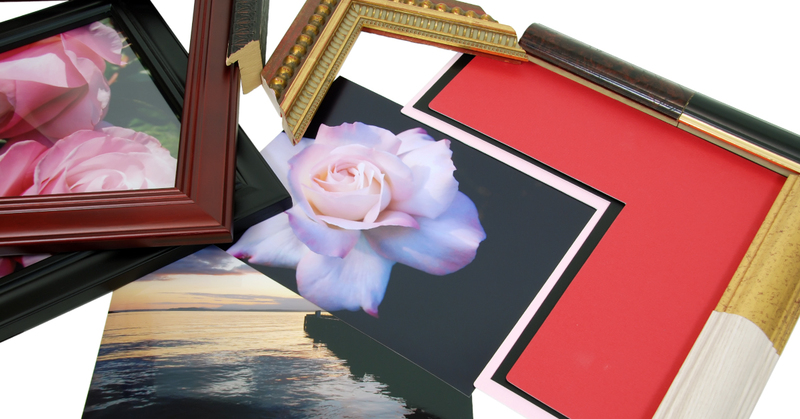 Finding the right custom picture frame can be an involved process. Depending on the quality of your art, you might want to consider how much you’re investing. If you’re framing a child’s art project, something on the more introductory level might work fine. But if you’ve purchased a piece from a gallery or an artist you respect, you might want to splurge on something to really make your picture pop. Think about how much the artwork means and speaks to you, and invest in the proper picture frame accordingly. The best way to decide the best frame option for your work is to let the artwork lead. Examine your art for colors or shapes that might be brought out with specific styles or settings. Once finished and hung up you will be surprised by the dramatic impact custom framing has on a piece of work. If you’re still having trouble deciding, you can speak to our framing experts to develop a better understanding of the process. The right frame will complete the look of your work and transform it into a professional piece that will last years to come.